It’s back again! Brown Acid The Seventh Trip is out everywhere on October 31, 2018. Put your seatbelts on, it’s going to be a bumpy ride. Everybody’s favorite source for the hard stuff is back in business, with ten more lethal doses of rare hard rock, heavy psych and proto-metal! These obscure tracks have all been licensed, the bands have been paid, and the sources are all analog. The quality of tracks seems to increase along with the number of Trips and this cohesive collection comes outta the gate with both guns blazing! You may not already be familiar with Schizo, but you should know at least one of the French freaks behind this short-lived group. Richard Pinhas was the co-writer and uncredited, wah-wah abusing guitarist in Schizo after his stint in Blues Convention. Schizo recorded just two singles, the first being the heavier of the two, before Pinhas went on to record with Heldon and then going solo. The band had a unique vibe that didn’t sound unlike Lemmy fronting a gang of stoned Martians. Youngstown, Ohio is the most commonly referred to city of the entire Brown Acid series. This town of just under 150,000 people may’ve had the highest (literally and figuratively) per capita output of heavy 45s. Blue Amber recorded this in 1971 at Gary Rhamy’s analog Mecca, Peppermint Recording Studios. This two-riff boneheaded banger sounds like a caveman protest song with an extraordinary amount of delay on the vocals. No wonder this 45 fetches three-figures on the rare occasion it comes up for sale. Batting clean-up, we have Negative Space, the only LP sourced track on this album. This crunchy jam comes off the band’s 1970 record entitled Hard, Heavy, Mean, & Evil. At over six and a half minutes, “The Calm After the Storm” is the longest track included on this volume, but it never gets dull. Fun fact: before changing the name to Negative Space, Rob Russen called his band Snow and released the “Sunflower” 45 in 1969 – you might recall that groover from the First Trip. B must be short for Bangers, ‘cuz this side is full of ’em! The flip of this Trip begins with a virtually unknown Oklahoma record from 1973. Blizzard was Rod McClure’s high school band, but you couldn’t possibly guess that teenagers recorded this heavy slab on the Token (should’ve been Toking) label. It’s one of the best we’ve comped and it sounds like a hypothetical MC5/Hendrix collaboration. The “Under the Ice” level drum fills will knock your socks off if the heavy shred doesn’t first. OOOOk-lahoma, where the wind comes sweepin’ down the plain and apparently where the fuzz goes seepin’ in your brain! Third World is the second Okie inclusion on this Trip and we couldn’t be more stOOOOOked to be sharing this very obscure single with y’all. If the heavily distorted two-note riff doesn’t grab ya, the apocalyptic Grand Funk vibes will. Once they get their mitts on ya, Third World will take you back to 1971 and leave ya there. Can we hitch a ride too? Ever heard of Virginia, Minnesota? We hadn’t either until we got in touch with Calvin Haluptzok and got the back story on his band Sweet Wine. This bitchin’ one-off 45 must’ve melted the snow off the roofs of the households brave enough to play it when it came out in 1970 and it’s still red hot nearly 50 years later. This vino may be sugary, but it packs an incendiary punch! Sadly, Calvin passed before we could get his music re-released, but it was nice to have reached him before it was too late. The Sweet Wine legacy lives on thanks to the Brown Acid archivists. C.T. Pilferhogg wins the award for most puzzling band name in our series. What’s not puzzling is how righteous both sides of their self-released 1973 single are! Featured here is the A-side “You Haul” which is one of the best examples of a poor man’s Deep Heep (Deep Purple meets Uriah Heep) we’ve ever heard and the demonic Echoplex-laden laughs mixed into this track are out of control. The band was touted as “Southwest Virginia’s Finest Boogie Band”, but don’t let that fool ya.vThey could bang heads with the best of ’em. The closer on the Seventh Trip is one we hold very near and dear. Not only is this record the one that’s taken us the longest to secure the rights to, it’s also one of the very best examples of heavy psych you’ll ever hear. The track rings your bell (literally) straight out of the gate and the dank psychedelic vibes kick in immediately. Summit‘s “The Darkness” was recorded in a basement studio in Kansas City in 1969 when the lead guitarist was only 16. The band was from a rural Missouri town, played only one impromptu gig in Clinton, and pressed only 125 copies of this, their only single. It should come as no surprise that it sells for hundreds of dollars when it’s offered. That’s a small price to pay for such greatness. Brown Acid is best for everyone involved,” rather than simply bootlegging the tracks. When all of the bands and labels haven’t existed for 30-40 years or more, tracking down the creators gives all of these tunes a real second chance at success. 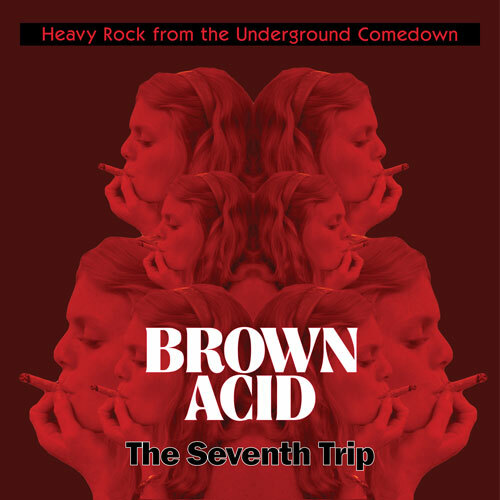 I just got Brown Acid: The Fifth Trip from Sister Ray in London and it’s great. Please tell me where I can get the first four trips and the sixth trip?